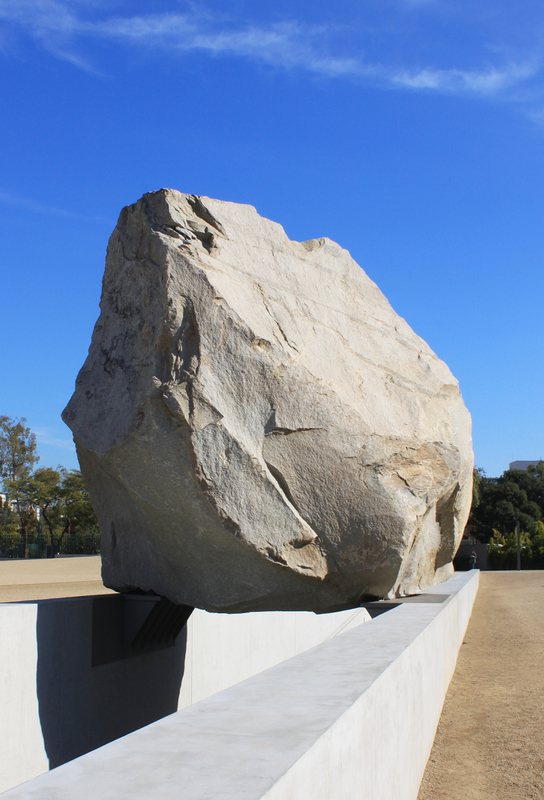 I feel like I should be finished with my trip south and get back to Bay Area subjects, but the last thing to post from my trip was my visit to see Levitated Mass. 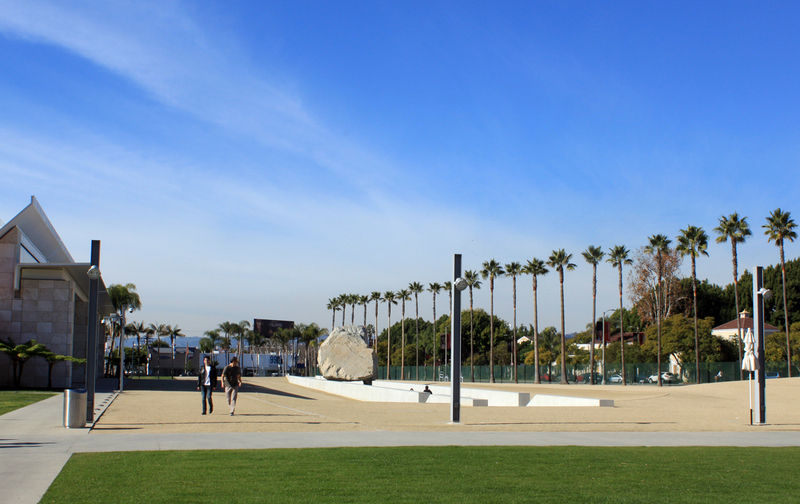 It’s a 340 ton boulder-turned-sculpture at the LA County Museum by land artist Michael Heizer. 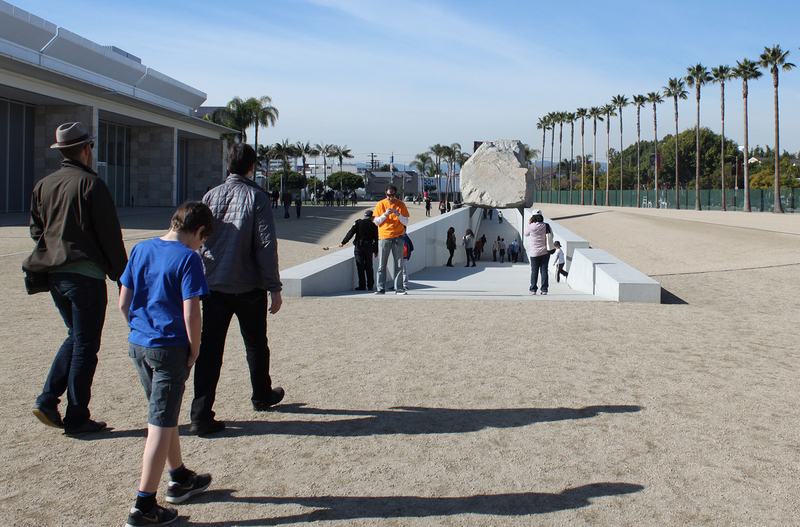 I don’t have a strong opinion about Heizer’s work, but I was fascinated by this project when I heard about it. As far as I know it’s the biggest and heaviest rock ever moved. Heizer got the idea in the late 60’s and then spent about forty years looking for the right boulder. Then, after he found it, he needed 5 more years to raise the $5-10 million dollars for the project, including $1.5 million just to move it about 100 miles from the quarry to the museum. The movers had to use a special trailer 260 feet long and 32 feet wide with 196 tires, they could drive only at night, they couldn’t exceed 8 miles per hour, and I think they had to move or take down some telephone wires and traffic lights that hung too low over the road. There were also several delays involving the permits required to travel through all of the different jurisdictions. Different challenges than the ones that faced the Brits who built stonehenge or the Gauls who moved around the menhirs, but still pretty compelling. Having spent so many of my working hours moving big rocks and even more of my leisure hours climbing on them, I thought I was the target audience for this piece. It turns out I’ve probably spent a little too much time focused on rocks, because I liked the concept more than the execution. The mass just doesn’t seem levitated; it’s so obviously sitting on metal brackets and straddling a concrete trench. The boulder is supposed to look huge, but it’s diminished by all of the open space around it and by the long trench. The trench itself is kind of beautiful in its own way, but it’s so deep you can’t touch or really interact with the boulder. And the climber in me feels like the rock face you first see is really the backside of the rock, the downclimb. I’d like to see the prow facing towards the entrance. But despite my complaints, it’s hard not to like a great big rock on an elaborate pedestal you can walk through, and there are a lot of impressive things about pulling off a project of this scale. I don’t regret making the effort to see it, and everyone else there seemed to like it too; Facebook must be filled with photos of people posing with their hands up so it looks like they’re holding the rock. Boulders are fundamentally cool, especially 340 ton boulders, and this one was fun in a ‘giant whale sculpture in front of the aquarium’ kind of way. I just wish they’d let me climb on it. 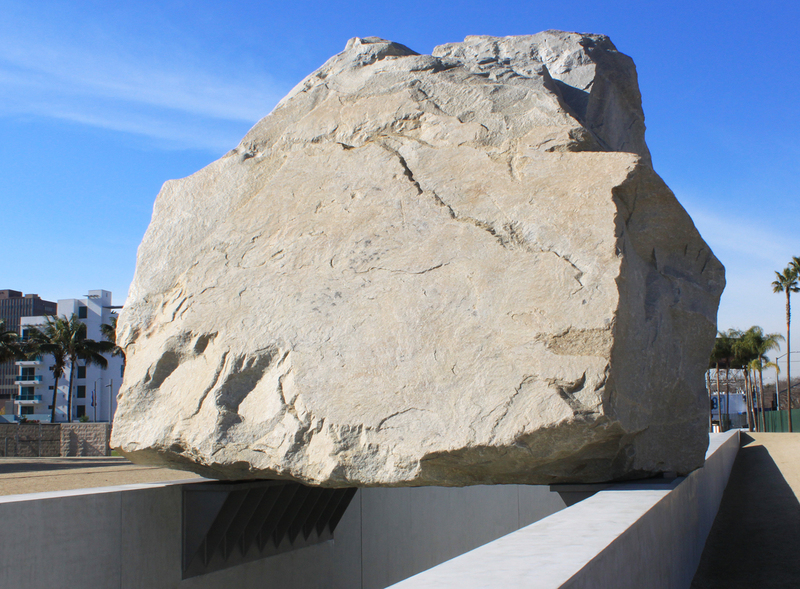 an interview with Heizer when Levitated Mass was under construction. Infrascape Design wrote several posts about the boulder. This entry was posted on Sunday, March 17th, 2013 at 6:11 am and is filed under stone. You can follow any responses to this entry through the RSS 2.0 feed. You can leave a response, or trackback from your own site. One of these days I’ll have to take a hundred yards’ detour on my walk in to my office to shoot some photos of Tim Hawkinson’s Bear, another project featuring manipulated boulders, though in this case the structural system doesn’t intrude. That piece has your name all over it! I’d be interested in hearing what you think. My friend said the same thing that the moving of the rock was the most compelling part. In a way that’s true of the standing stones and menhirs, too, so maybe it’s no different. Back then there were probably people like me standing around complaining that a third of the rock was buried underground. I just googled Hawkinson’s Bear. It looks cool, definitely something I’d like to check out. Which is funny, because I’ve never liked the Stuart collection at all, not since my days in school there. Interesting – I came here via Lost in the Landscape’s bear having not really heard of this sculpture. I’ve been attending some geology field trips/lectures and over and over again I find the shapes and colors and everything have for me all the qualities of modern art and more. I just really don’t get a lot of modern art, really, however much I’d like to you know, be cool and all. I do like Andy Goldsworthy though. Thanks for sharing your experience of this piece – I enjoyed reading your post.